Worked as a weaver in his youth. Seminary student with Saint Francisco Coll Guitart. Ordained on 13 June 1835. Missionary in Catalonia and the Canary Islands. Directed retreats. Founded the Congregation of Missionary Sons of the Immaculate Heart of Mary (Claretians). Archbishop of Santiago de Cuba on 20 May 1850. Founded the Teaching Sisters of Mary Immaculate. Following his work in the Caribbean, Blessed Pope Pius IX ordered Anthony back to Spain. Confessor to Queen Isabella II, and was exiled with her. Had the gifts of prophecy and miracles. Reported to have preached 10,000 sermons, published 200 works. Spread devotion to the Blessed Sacrament and the Immaculate Heart of Mary. Ninth of thirteen children born to Lawrence and Maria Guanella, a poor but pious family. Luigi entered seminary at age twelve, and was ordained on 26 May 1866. He worked with Saint John Bosco from 1875 to 1878 to care for homeless children. Youth director in Turin, Italy. Parish priest in Traona, Itay, where he opened a school for the poor; local anti-Catholic Masons forced its closure in 1881. Parish priest in Pianello del Lario, Italy in 1881 where he founded an orphanage and nursing home. In 1886 the need had outgrown the facility, and Father Luigi moved the home to a larger building which he called the Little House of Divine Providence. There he founded the Daughters of Saint Mary of Providence to minister to the residents; the congregation received papal approval in 1917, and today has over 1,200 sisters working in over 100 homes. In 1908 Luigi founded a men's congregation, the Servants of Charity (Guanellians) which received papal approval in 1928 and 1935, and today has over 500 brothers in over 50 houses. Father Luigi never bothered to retire, continuing to write meditations and inspirational works, and mininster to those in need. Friend and advisor to Blessed Andrea Carlo Ferrari and Pope Saint Pius X. He reclaimed marsh land in the Sondrio region, and built an institute for the handicapped. He worked in the United States with Italian immigrants in 1912. In 1913 he founded the Confraternity of Saint Joseph whose mission is to pray for the dying, and which today has 10 million members. In 1915, just months before his death, Luigi went into the fields to minister to those who had been harmed by a series of earthquakes in the region. Lector while still a student. Secretary to and spiritual student of Saint John Chrysostom. Priest. Archbishop of Cyzicus, by the people of that city saw him as being under the control of Constantinople, and refused to accept him. Noted preacher in Constantinople. 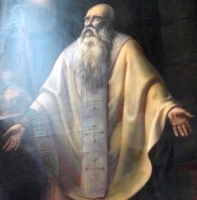 When Nestorius was chosen patriarch of Constantinople and began openly spreading the teachings that became known as the Nestorian heresy, Proclus continued to preach orthodox Christianity. Archbishop of Constantinople in 434. Friend and frequent correspondent with Saint Cyril of Alexandria. The Armenian bishops turned to him for analysis of the writings of other leaders. Noted for his forgiveness of heretics who wished to return to the Church, but his defense of and insistence on adherance to the true teachings of the Church. Many of his letters, sermons and teachings have survived. Hands-on leader of his clergy and minister to his flock following a destructive earthquake in early 447 that led many to live in open fields for fear of collapsing buildings; legend says that he led the people in prayers that stopped the quakes. Son of pagan parents. In his early 20's he became the spiritual student of Saint Martin de Vertou, and converted to Christianity. 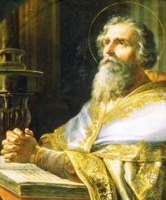 Hermit whose wisdom and piety attracted would-be students for whom he founded a monastic community; Blessed Euphronius of Tours consecrated the altar of the monastery church, and ordained Senoch as a deacon. Benedictine monk. Abbot. Ordained a priest at Tours, Neustria (in modern France). A miracle worker with the gift of healing by prayer, he returned to his home town and openly tried to impress people with his power and wisdom; they ran him out of town, he took it as a learning experience, and devoted himself to his house and his own spirituality. Friend of Saint Gregory of Tours who was forced to publicly chastise Senoch for paying more attention to his own spiritual practices than the running of his house or the spiritual growth of his monks. Born wealthy, to a family well-known in his region. Ordained a deacon by Saint Felix. Noted for his lack of skill as a preacher. Hermit in the Dumen forest at Brittany. 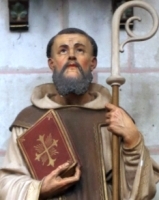 There his obvious sanctity attracted so many followers that he was forced found Vertou abbey near Nantes, France and serve as its first abbot; legend says he was led to the site of the monastery by an angel. Later founded Saint Jouin-de-Marne abbey, the convent at Durieu, and assisted in the founding of other houses. Reported miracle worker. Sixth of nine children. Priest in the archdiocese of Verona, Italy. Founded the Sisters of Charity of Saint Mary in 1882. Founded the Little Sisters of Saint Joseph in 1894. Monk. Went to Brittany with Saint Samson of York. Abbot of Lammeur Abbey. Bishop of Dol, France. Built and retired to a monastery on Sark in the Channel Islands. Martyred in the persecutions of Diocletian when he refused to give up copies of scripture for destruction. Christian princess of the city of Nagrana (modern Najran, Saudi Arabia). She, her husband and children were part of the Martyrs of Najran who were killed by order of Dhu Nuwas, king of the Omeritani who had converted to Judaism and demanded that everyone in his kingdom do so, too. Christian prince of the city of Nagrana (modern Najran, Saudi Arabia). He, his wife and children were part of the Martyrs of Najran who were killed by order of Dhu Nuwas, king of the Omeritani who had converted to Judaism and demanded that everyone in his kingdom do so, too. Layman. Soldier. Captain in the army of King Tu-duc. Convert. Martyr. Fifth-century bishop of Cologne, Germany. Murdered by heathen robbers. Martyr. Bishop of Thibiuca in North Africa. Martyred in the persecutions of Diolcetian for refusing to surrender sacred books for destruction. Hermit at Monte Cassino Abbey. Hermit in a a on Mount Massicus. Monk. Abbot. Bishop of Coutances, France. Sixth-century spiritual student of Saint Iltyd. Founded churches in Penegoes and Abererch in Wales. Three Christians martyred together. All we know about them are the names Mark, Sotericus and Valentina. 342 priests, religious and lay people who were martyred together by order of Dhu Nuwas, king of the Omeritani who had converted to Judaism and demanded that everyone in the his kingdom do so, too.